When buying an engagement ring, we recommend that you have an understanding of the four quality characteristics that define a diamond’s beauty (and subsequently the price). Knowing what you are looking for will make your visit to the jeweler less overwhelming. Choose the shape first, then the cut, color, carat, and clarity will all go hand-in-hand after that. The metal framework in which your stone is set in is called a setting or mounting. Choosing the the setting will set the tone for the ring. There are many styles to choose from. What kind of jewelry does she wear? Does she prefer yellow or white gold? Platinum? Does she like modern or vintage styles? Does she have any metal allergies? When choosing the type of metal, keep in mind that the type you choose will likely be the same type that hers and your wedding rings will be made in. Consult her closest friends about what she might have mentioned (if you can trust that they will keep a secret!). Establish a price range in mind. Setting specific parameters of what you are looking for before going into the store will help you stay on budget. Work your budget well. For example, buying just under the next carat size (e.g. 0.97 instead of a 1.00 carat) can save you a bundle. Also, buying a near colorless stone as opposed to a colorless grade will go a long way. See our article on how to measure her ring size. Do not guess her ring size. Take pictures of other items in her jewelry box while you are in there. This will give you a visual reference of her preferences and style. Going the custom route can get you more for your money. You don’t have to pay that additional mark up you get when you purchase a brand name. Custom designing your piece allows you to tell a story through it. 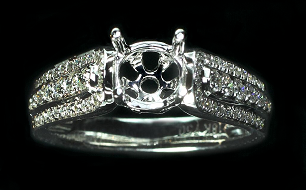 At Silverberg Jewelers, there is no additional cost in getting a ring custom made compared to one in stock. If you wish to engrave it, be sure to mention that when you order.